It seems to me that we are just a few situations away from having a real contending team next year… possibly a lot bigger threat than what we had this year (during the early season hype). Is it possible the heavy penalty on Silvio represents the final penalty on us? A whisper came to me that the Silvio challenge by us is a message that we will litigate the NCAA if they go for tough sanctions. My question for the whisper is… perhaps the NCAA was testing the waters on us by laying down the heavy penalty. I know it’s a big “what if” but what if Silvio is cleared? What if we recruit a good, experienced grad transfer shooting guard (or big man if Silvio isn’t cleared) and others for added experience? Marcus, David, Ochai, Mitch… returning with more experience. Am I missing something? Couldn’t we suddenly go from darkness to light? Might we have a very experienced, talented team that could easily play in April next year? Might this team carry a chip? It’s frustrating… but don’t be surprised if he makes it in the league, at least as a reserve. Reality will set in with Q before long. No more easy street cred. From here on out, his game will do the talkin’. That’s the first reality to come for these young guys. There is a million guys that “came close” out there. It’s a brutal awakening… the NBA clock starts now and it’s a short clock. Q has to get hooked up with someone to develop. If he picks his agent right, the agent will set him up, or a team who is interested will. The real work starts now. No time to goof off. No time for KU classes. Just train. We will quickly see if he can really stand a chance. Within 6 months his body should look completely different. No more pudgy thighs! Right now he is a full step behind any NBA player. I expect Bennett to start recruiting better. I think he recruits the right guys for his system. He’s starting to figure out that he still needs some offense to win titles. I’ll tell you one thing… he puts Self to shame when it comes to playing “BAD BALL.” No “offense” to Self… but UVA used to like games in the 50s, and once in a while they get one in the 40s. I’m still surprised no D1 coaches have figured out how to find some real rough-cut diamond future defensive specialists… For those, go to D1 football recruits and look at defensive backs. Many of those guys that are just under being the top but are multi-dimensional athletes would be great pickups. If Self really ends up with many holes next year he should pick up a couple. They will toughen up the entire team and make all our guys better on offense, too, because no more easy baskets in practice. Football players have different attitudes… especially defensive players. There are plenty of these uber athletes out there that run 6’2" or taller and can jump out of the gym. Look at our prized Garrett. He sort of fits this mold. I’d love to have a couple Garretts on our team. Remember Clint Normore? He made a HUGE difference on our NC '88 team! I feel your frustration. 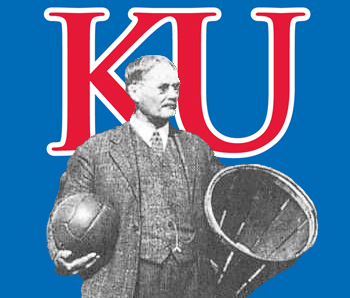 I agree that I want players who put KU and their opportunity to play for KU paramount. But I draw the line getting down too hard on Grimes. I don’t think he ever pretended to be a huge KU fan. He was a guy that came into Lawrence “hyped up” and ranked. That is what we get for gambling on him. As long as we play this concept of putting much of our eggs in the “elite basket” we can expect to have more of the same. I guarantee you this happens at all the elite schools who are busy recruiting elites. I know I’m becoming more of a Virginia fan every single day! I hope Bennett doesn’t use his new added prestige on going towards higher recruits and selling out his damn-good model on how to coach D1! But I’m not the normal D1 basketball fan. I’m a basketball geek who loves defense… loves rebounding! From what I have seen of Grimes, he isn’t anywhere near ready to dribble on a NBA court. But that doesn’t mean he won’t be later, and that later could be within a year! When these kids get hyped up they get a free pass to an opportunity at the next level. That means they get exposed to the developmental tools to get there. Money fuels all of this, and marketing creates money! A hyped kid is already floating around with followers, dreamers and the like. I’ve read plenty about Grimes. He sure seems like a really good kid! I advise rethinking all of this. The problems are in the system. Not the kids. In fact… even the players that seem the worst… there is a reason why they are the way they are. It’s a little too much to just expect these teenagers to be wise beyond their years, spiritual, and without any tarnish from the fairytale existences they have suffered with their entire lives! I’m back coaching kids basketball. The problems start far before a kid dribbles a basketball. I personally went through this with my son, who within his first year of life was projected to be in the top 2% in height. That built all kinds of fairytale thoughts in my head. I’m back to reality now and I will accept him for who he is and what makes him happy! I think you and @BigBad are both right. We have been made aware of academic violations from big players, like UNC and Syracuse. I expect that this is going on any many schools. But there are also many schools operating above board. The DOJ is completely understaffed to handle the wide scale crime going on in our country. They have to limit focus based on manpower and overhead. I expect to see a bit more of a broad sweep on academic crime eventually… kind of like what we are now seeing on their “pay to play” bust on elites buying their kids way into schools. I think it is fair to assume their bust was meant more to warn the world that there is a risk they run doing this because they only scratched the surface. We all need to drop our current careers and go work on passing the bar. Hate to say it… we all complain about how lawsuits are damaging our way of life… just wait! The tsunami hasn’t hit yet! Look at that “pay to play” elite bust… it is opening up all kinds of legal challenges… class action lawsuits involving millions of people. I’m still waiting to hear about a class action lawsuit brought by past athletes who feel they have been damaged by these proven academic cases. I know there are cases outstanding now involving non-athletic students. I’m guessing the student-athletic case or cases are already out there. I expect that to become popular soon, so I better complete my copyright on that so I can sue people for using it! Take their phones away from them. Tell them their future phone possession will be directly related to their rebounding stat sheet in practice. Ha… it’s a great way to tick your kids off… but if you make it a real competitive challenge, eventually they rise to the entertainment level of the competitiveness. My recent “sourness” makes me sound like I think most of these 5-star recruits are just self-centered and completely not caring about Kansas and the legacy of our great school. I don’t want to judge every young man with one blanket statement. I think the truth is, the highly-touted players are focused on what they think their future employment will be. That often runs counter to fitting the fans’ and coaches’ mold of what they should do. A more extreme example was Zion this past year. Many NBA guys told him to quit in the middle of the season to “protect the goods.” I’ve been hearing this guy might be worth $1 billion in his career. Just how much is a guy like Zion supposed to care about Duke? Enough to risk $1 billion? Yet… he did hang in there and put out the effort! And I get down on our coaching staff for not getting these guys better coached up. All these guys come in here with their own attitudes and expectations, often conflicting considerably with our coaching staff and fanbase. But the players are the players, and they come in here usually being built up to think they are the next Messiah. Are they to blame for that? Ha… they are kids! My idea is to focus on developing the players, even within the limited scope of what D1 coaches can coach their players. Going “all in” on development and touting that on the recruiting trail is a way to filter out kids who are looking for an easy ride and don’t want to dive for balls. Much of the atmosphere for success isn’t what the coaches have to offer or that direct environment… it is the indirect environment… the school life! Do the players really desire to put in an extra 20 hours a week on their trade, late at night? If they do, they will advance their games quickly. I saw that happen with the Lawson brothers this year. Dedric stayed in the gym and worked on his trey ball… and look what happened! Can we say that about every player on our squad? That guy worked his tail off to strengthen his body and become a more-rounded player. I believe he’ll make it at the next level because he has the work ethic and focus. He may not be an athletic elite, but who cares when the guy knows how to fill a stat sheet! The one area of basketball, where it truly exposes players and their level of being “coached up” is rebounding. I’m back in coaching my own kids, right now, oldest is age 5. I can guarantee you he thinks more about sealing off the glass when the ball is shot than our players do. It isn’t even close! Why is that? Kansas basketball is such a big deal to probably millions of people. It’s something that generates millions in revenue. It’s a big deal! Yet, my 5-year old kid thinks and reacts more on rebounds than the cream of the cream athletes we recruit? Look at the NC game this year. Those teams got after it! It may not have been the game with Zion dunks… but it was two teams that were focused, coached up, and got after it! I was thrilled to watch the FF this year! I look at all of this as a development issue. Players need to be developed. Why Malik left? Why would he stay? The reason for any of these guys to stay is they will become more marketable and skilled if they stay another year. There is always a risk of injury… and so they best become a lot better if they decide to stay another year. Did Malik improve while at Kansas? I think there is a good case for saying yes. Though part of it was just him feeling comfortable with his role on the team. Would he have continued to make gains staying another year? Maybe he didn’t consider it enough of a factor to stay! I don’t want it to sound like I don’t think our guys improve quite a bit while in Lawrence. They do. Just not to the level I would like to see. And at the level I’m talking about, I seriously doubt we lose many players early who really aren’t ready to jump to some form of pro ball.